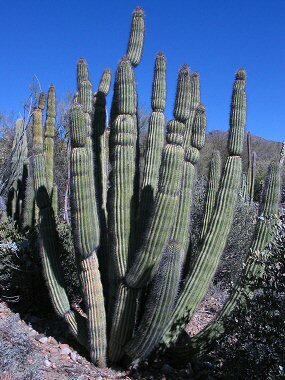 The Organ Pipe Cactus is one of the larger members of the Cactus Family. It is easily identified by the fact that it usually has many thick stems to 8 inches in diameter which grow upwards from a central location to a height of up to 20 feet. In the US, the plant can mainly be found within the boundaries of Organ Pipe National Monument in southwestern Arizona, which was established in order to protect this species. Preferred habitat consists of rocky desert and hillsides at elevations between 1000 - 3500 feet. The Sanborn Long Nosed bat is the most important pollinator of the Organ Pipe Cactus. The Organ Pipe Cactus typically blooms between May - June and produces pale lavender, funnel shaped flowers to 3 inches in width which grow along the sides and tips of the stems. Flowers are followed by a red, spherical, spiny fruit to 3 inches in diameter.